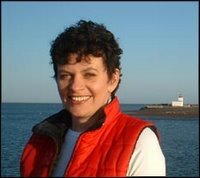 WORLD WHALE BUZZ: Bay of Fundy's Terri isn't on our Frozen Beaches! Bay of Fundy's Terri isn't on our Frozen Beaches! So the following post shows up on my Google blog alert this evening. No wonder bayoffundy.blogspot.com is relatively quiet. Instead of prowling the frozen beaches of the Bay of Fundy and telling us how wonderful it is, Terri is in balmy Georgia "snooping around" for our Bay of Fundy right whales! I'm on holiday this week in the state of Georgia, USA. The North Atlantic Right whales that summer in the Bay of Fundy spend their winters here too. 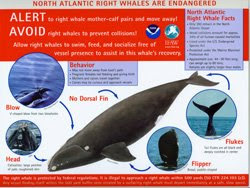 In fact, the only known calving grounds for Right whales is about 15 miles (24 km) off the coasts of Georgia and Florida. Later, in early Spring, they'll head up to the coast of Maine, then on to the Bay of Fundy for summer and fall feeding before coming back to Georgia. In the United States several laws have been passed and regulations adopted to reduce threats to Right whales. Measures in effect for Georgia include designation of the coastal waters south of the Altamaha River and out to fifteen miles as a "critical habitat" for the species, ship reporting requirements, restrictions on the use of gill nets, and prohibitions on recreational right-whale watching. The Georgians appear to appreciate our shared Right whales, having declared them as their official 'state mammal'....I'm not sure why we haven't done the same in New Brunswick and Nova Scotia....good idea! Seems like warm weather has stimulated Terri's already fertile cranium. She's right. We have equal responsibilities for this unique endangered whale. Let's partner with Georgia and other states who share this responsibility to protect this important whale and unite our efforts! Also we need to follow up on this great suggestion right here in Atlantic Canada. Couldn't a symbol for "Atlantica", be a right whale, something that reminds us all that north-south trade needs to be done with great caring and stewardship. Flag from Wikipedia. Georgia poster posted by Terri.